We’d love to welcome you to our practice here in St Albans so you can chat through your needs and priorities… or simply so you can come and have a look at us for yourself! 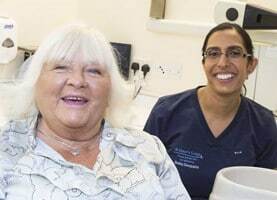 If you do want to join us, it’s easy to register as a new patient – a two-minute call on 01727 853160 is all it takes, or you can register face-to-face if you prefer. Once you’re on board, we’ll send you a letter to confirm your first appointment together with a medical questionnaire and Practice Leaflet. We’ll then invite you to come for a new patient assessment. Nothing scary – it’s just a forty-five minute consultation appointment with one of our dentists. You’ll have plenty of time to talk about your dental concerns and we’ll explain how we can help your oral and dental health. At the first appointment, we carry out an extensive examination of your teeth, gums, and the soft tissues inside your mouth, also screening for mouth cancer. We then take any radiographs (x-rays) that may be needed. All of this gives us an accurate picture of your oral health, which means we can then talk over the examination findings with you, as well as any possible treatment options. At St Peter’s Lodge you stay in control of your treatment at all times. You’ll never be pressured into any particular kind of treatment, and all your options will be discussed in as much detail as you like. You’ll also be given a full breakdown of any treatment costs at the end of the appointment. We won’t carry out any treatment on your first visit unless you want us to – to alleviate pain for instance. If you want some time to think about the options you have been given, that’s great. We’ll do everything we can to help you make a fully informed decision that’s right for you. 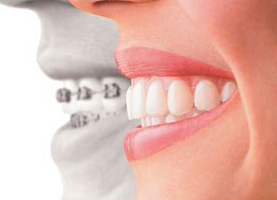 If you are interested in cosmetic dentistry or implants to improve the appearance of your teeth you’ll also be welcome to talk this over and ask our dentists’ opinions. 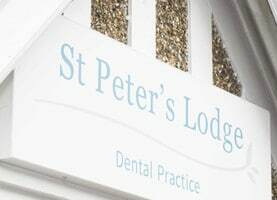 Long-lasting patient relationships are very much our style at St Peter’s Lodge and this approach to dentistry ensures your visit is effective, informative and, of course, anxiety-free. It’s our philosophy to ensure that patients only receive treatment or services that they want and need. If you have any queries prior to booking an appointment or attending for your initial consultation please do not hesitate to call us. Our people recognise that the perfect dental practice for your children isn’t just one where the staff are experienced in working with children… it’s one where they like children! 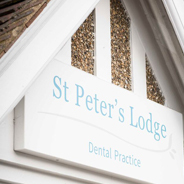 St Peter’s Lodge is and exceptionally ‘child-friendly’ practice. We know all about the special attention that our younger patients need and we aim to inspire them to embrace the concepts of oral health and the prevention of dental disease. By providing regular check-ups and advice, our dentists can help your child keep healthy teeth for life. We aim to make your child’s experience of dentistry stress-free, educational… and even fun!